A boat name can say a lot. So when you slap a boastful challenge like Up To It across the transom, you’d better produce if you don’t want to bear the brunt of jokes at the local marina bar. The 60 Hatteras certainly lived up to its name when it christened The Wharf Marina scales Friday with a 442-pound blue marlin. 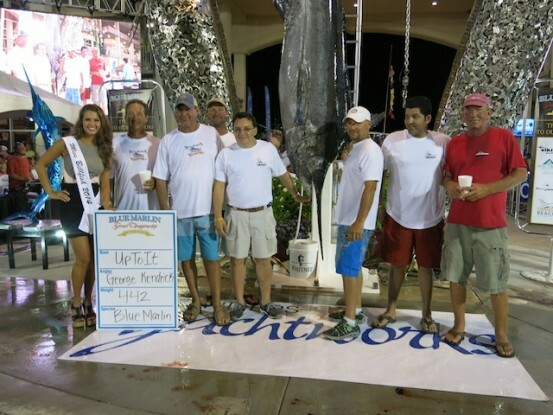 That fish, caught by George Kendrick, was the first qualifier of the 2014 Blue Marlin Grand Championship and it brought a roar of approval from several thousand spectators once it was hoisted aloft. Tolbert, who won the Bay Point Invitational Tournament in 1986 (which was also run by Grand Championship Co-Director Scott Burt) said conditions were perfect offshore. Up To It was trolling between the Beer Can rig and Drill Ship when the marlin struck. Friday marked the first full day in this third-annual big-game event. Fifty-seven boats are hunting for trophy marlin, tuna, dolphin and wahoo to earn a share of the $1.327 million in prize money. Two other boats, Relentless Pursuit and Dirt Pit, have both reported boating marlin measuring 114 inches but will wait until Saturday to come to the scales. Up To It’s fish taped out at 105 inches, according to weigh master Craig Martin. So come early and watch as the fleet triumphantly returns. There’s only one Up To It. But there are 56 other boats that could be named Can Do Too.